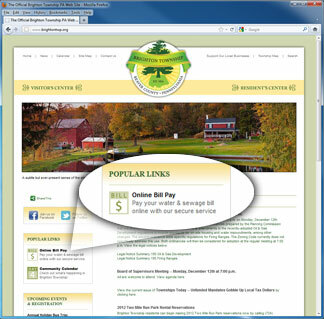 The Municipal & Sewage Authorities have recently added online bill payment to their utility billing operations. 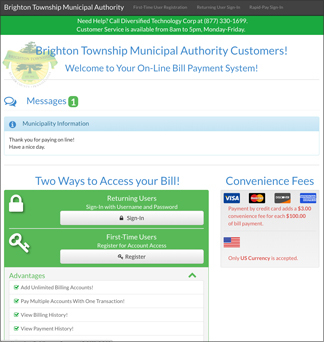 Customers may now access the utility bill payment system by clicking the Online Bill Pay link on the Brighton Township home page. You will need your account number as listed on your bill card to logon. You will be asked to create a unique user password. When registering you must list your NAME and SERVICE address EXACTLY as it is listed on your bill card. The on-line account will show your current billing/balance only. Only one transaction can be posted to your account within a 24-hour period. The minimum payment is $20. The maximum payment is $1,000. You can print a receipt after you have made your transaction. There is an automatic logoff after your payment is entered. On-line payments may take up to 24-hours to be posted to your account as you see it on-line. Due to the volume of transactions please allow at least seven days for mail or drop-off payments to be posted to accounts. The web link is on a secure server and the data is not in danger of being stolen, including your credit card information, which is not kept on line.